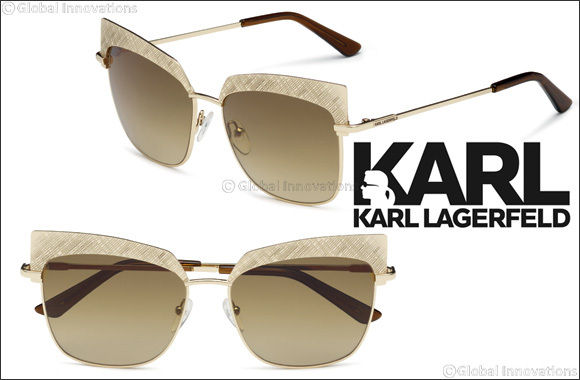 Karl Lagerfeld eyewear - Contemporary glamour, and high-tech design. Dubai, UAE, August 28, 2017: The new season is overflowing with innovative materials and high-impact detailing, with clear inspiration drawn from the sophisticated world of haute couture. Blazing a trail somewhere between contemporary glamour and hi-tech design, each model oozes creativity, elegance and class. One of the star pieces in the new advertising campaign, these oval-shaped women’s sunglasses are characterised by the perfect combination of plastic and metal, which gives the frames an attractive, highly glamorous feel. A unique metal structure defines the front section and sleek, flowing temples emphasizes the transparency of the acetate, creating a playful color effect. Available in Shiny Gold, Shiny Silver, Shiny Grey, Shiny Light Gold and Shiny Golden. The defining feature of these women’s sunglasses is undoubtedly their oversized, rectangular silhouette. The Chain model gets a makeover here, with chunky elements and sophisticated color-blocking that accentuates the high- impact front section with a mixture of transparent and full-color sections. The chain detail is incorporated into see-through-effect temples in plastic, adding an iconic, timeless quality. Available in Black, Havana, Blue and Bordeaux. These glasses feature a highly feminine shape and a bold look. Made from metal, the frames are decorated with a laser-etched saffiano pattern on the angular rims, while the logo is accentuated on the ultra-thin temples. Available in Shiny Gold, Shiny Grey, Shiny Golden and Shiny Medium Gold. Another of the key pieces in the new men’s advertising campaign, these aviator frames combine curved lines with a bold design. The classic silhouette is broken up by the double metal bridge and acetate detailing on the front section. The metal temples feature a sophisticated, saffiano pattern, applied using lasers. Available in Dark Gunmetal, Gunmetal and Light Gold. The fusion of geometric lines and feminine curves gives these frames a very bold appearance. The unmistakable Chain model is reinterpreted here in a geometric, rectangular guise, with the chain itself incorporated into the see-through temples. The color contrast between the transparent and full-color plastic is particularly attractive. Available in Black, Havana, Turtledove, Blue and Bordeaux.